Wyatts Flys/Capt. Bob Wyatt enjoys teaching folks everything there is about N.H.'s world class Landlocked Atlantic Salmon fishery. 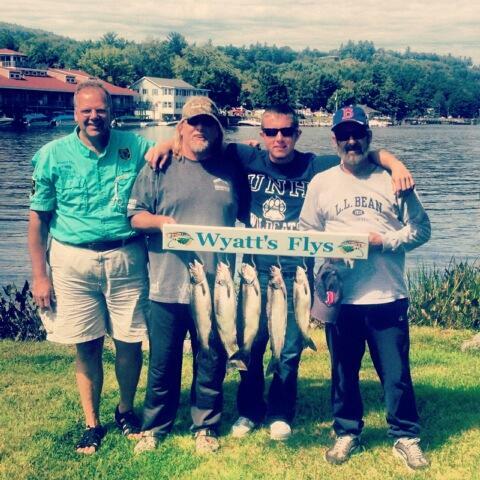 Our majority of charters are on Lake Winnipesaukee. During the off season we're busy tying flys, building fishing rods & teaching fly tying. Capt. Bob's been fishing the "NH Lakes Region" for over 40 years. He's very excited now to be sharing everything he's learned from this experience. Wether it be fishing, boating or fly tying. His Son Bumper & Grandson's Noah & Ryder will be joining us as their schedule permits.